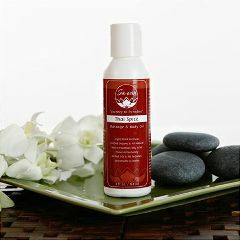 Light blend of natural and certified organic oils of rosa mosqueta, aloe, flaxseed, olive oil and jojoba for a consistent, smooth, silky glide. Pleasantly scented with essential oils of camphor, peppermint and rosemary for a spicy Thai experience. No nut oils and water dispersible. Choose from 4oz or 8oz. Use caution when laundering linens that have been exposed to oils. Oil products are potentially combustible when exposed to heat in the dryer. Consult dryer manufacturer's guidelines for drying linens that have been exposed to oils. I have looked for diabetic socks for my dad for weeks, He has small feet, yet (edema) on the legs. I ordered the socks from Allegro Medical and dad was so pleased. The top of the sock expands and is very comfortable for him, at (87) years olds he needs to be ok. Thank you again for a Great product.